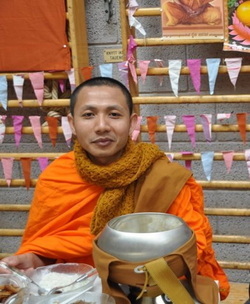 Venerable Kim Muon, a member of the Khmer Krom ethnic minority group in Vietnam, was forcibly defrocked, expelled from the monkhood, and imprisoned in Soc Trang province in 2007 after participating in a peaceful protest with 200 other Khmer Krom monks calling for religious freedom. He was interrogated and tortured in Soc Trang prison. UPDATE: After his release from prison in 2009, Ven. Kim Muon fled Vietnam and was resettled as a refugee abroad, where he continues to advocate for religious freedom and cultural rights for Khmer Krom people.